If you’re interested in amassing a collection of objects for your home that conveys a strong sense of individuality and energy, you’ve found your creative partner in Marvin Gardens! Contact us today to learn more about how we can assist with your next design project. In the meantime, take a closer look at one of the residence we recently helped seasonally decorate! Contrary to popular belief, it’s very possible to have a beautiful and healthy garden in the winter time. There are a wide variety of plants that can be grown successfully during the cooler months and with a little bit of know-how and some TLC, they can thrive wonderfully into the spring and even the summer of the following year. At Marvin Gardens, one of our favorite winter plants has always been the Poinsettia with the whimsical Christmas Cactus not too far behind. 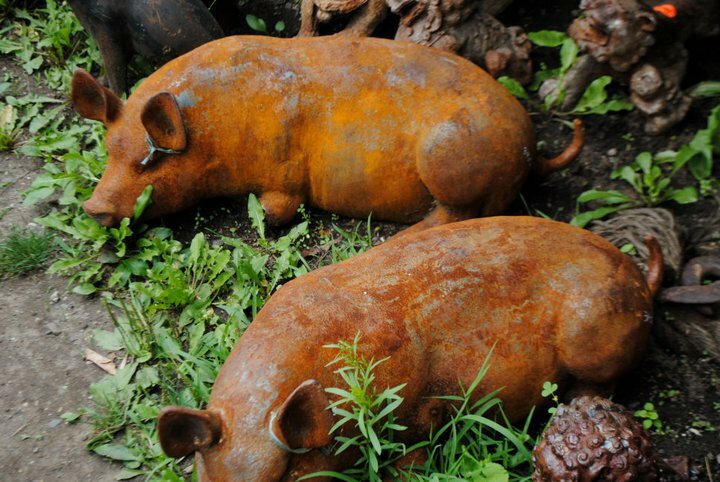 They both add such a festive touch of cheer to any yard and also liven up interiors just as nicely! Skimmia x confusa Kew Green: Shiny green leaves with fragrant greenish-yellow flowers. great for under trees in partial shade, drought tolerant. Choisya ternata Sundance: A rounded dense shrub, evergreen with bright yellow-green glossy leaves. Scented white star shaped flowers in clusters in late spring. Helleborus niger ‘Christmas rose: Clustered light green flowers on strong stems, forms bold clumps of deeply divided evergreen foliage. Contact Marvin Gardens today to learn more about how we can help with your holiday decorating! If your garden needs some character, there’s no way you can pass up this adorable collection from Marvin Gardens. 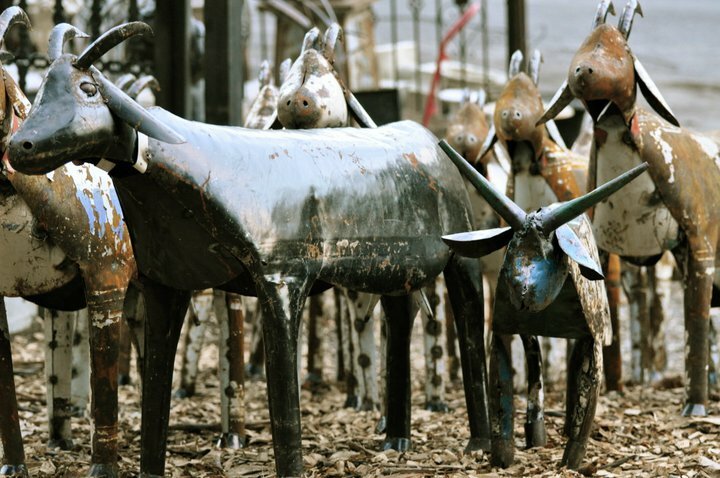 Featuring a wide variety of animals from piggies to goats and everything in between, “Animals” is a collection of Mexican folk art that’s been created from recycled pieces of industrial and agricultural sheet metal. Many of the pieces are life-sized creations that still bare original paint and lettering. These repurposed little guys make great holiday gifts so purchase a few today! Contact Marven Gardens for more info and visit the Animals album on our Facebook to see more from the collection. And don’t forget, you don’t have to be a member to view our Facebook page! How adventurous are you willing to be with interior wall colors? There’s something to be said for bold splashes of colors and it certainly can completely transform a space. On the other hand, various shades of white and eggshell colors are very neutral and versatile and can be the most efficient rout to take for some people. So which category do you fall into when it comes to your preference for room colors? The bold or the boring? At Marvin Gardens, we just love character. Whether it comes in a simple shade of grey, a flashy firecracker red or a plain-Jane white, character is what counts. But if you are thinking about adding some a bold new shade or two to your walls, take a look at a few or our favorite rooms as pictured in Canadian House & Home! Crafts and the holiday season inevitably go hand-in-hand. Decorating Christmas cookies, glittering stockings and of course hand-making ornaments are just a few of our favorites here at Marvin Gardens. One of our particularly favorite holiday projects is building gingerbread houses. Not only do gingerbread houses make the perfect holiday centerpiece, but they’re delicious and creating them is a fun activity for the little ones. If you’re planning on taking on the task of building one this holiday season, we’ve got something for you. Take a look these tips from Canadian House & Home for making sure your project goes off without a hitch! For more information on how to improve and simplify your holiday craft projects this season, contact Marvin Gardens.